And I’m not talking about food or family plans. 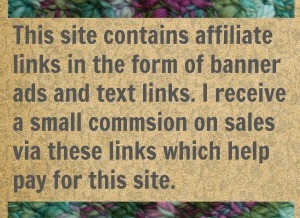 I’m talking about what to make this holiday with your yarn. Because you’re going to need a project to get you through Thanksgiving. Fortunately I have a suggestion! Whatever it is that currently occupies the honorable place as your “main” WIP may or may not be a good holiday project. Thanksgiving is often filled with travel. Either you are going somewhere to stuff your face or hordes of people are coming to you to stuff their face. If the hordes are showing up on your doorstep then you probably won’t have time to make a single stitch so don’t worry about it. I’m surprised you have time to read this post at all. 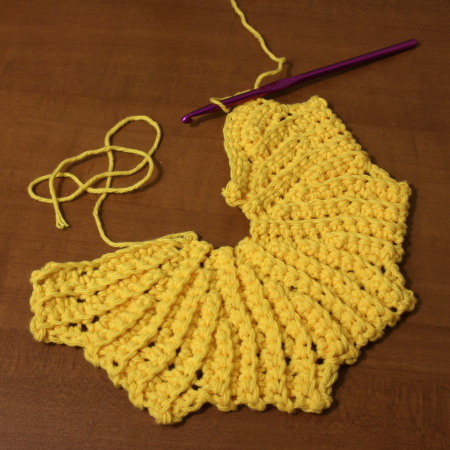 But if you are one of the traveling, face-stuffing hordes, consider using this occasion to make an Almost Lost Washcloth and/or its crochet copy aka Circle Point Washcloth. 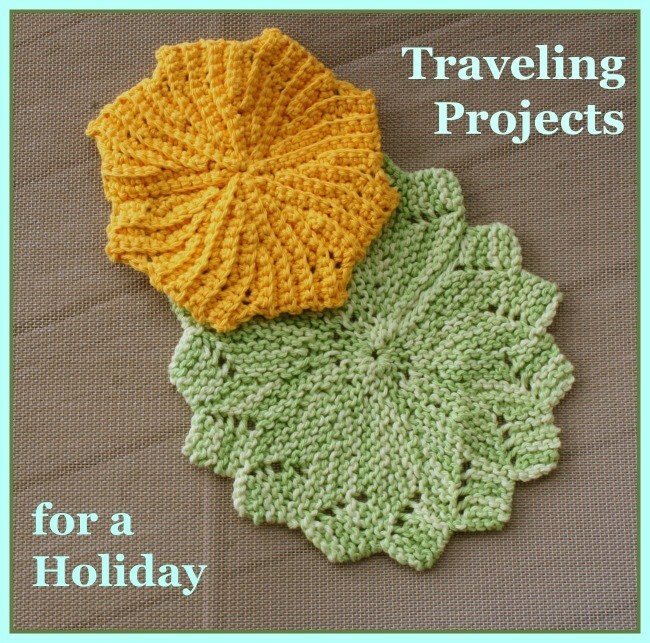 Any washcloth makes a great travel project. Its small. It needs just one ball. These two particular washcloths are easy enough that after you make one or two points, you’l have the pattern memorized and won’t need to carry it along with you. Finally they are just interesting enough to keep your attention. .. and once you have enough edges you sew the bind-off edge to the cast-on edge and close up the center hole. 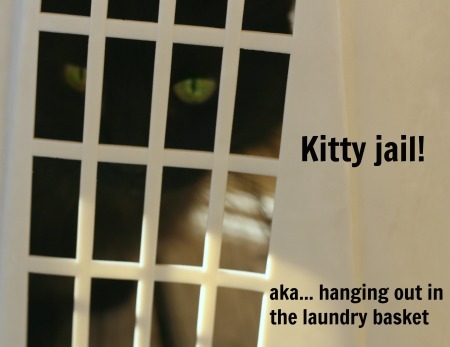 So grab a ball of cotton and some needles or a hook. Then you can kick back and stuff your face while ignoring the dishes, the amateur political analysts, and that tragedy of a game which is still the screen on but absolutely no one is watching anymore. 17 Comments on "What to Make This Holiday"
How “thankful” I am for your creative mind. Always thinking of things to improve our lives and times. Yes. I improve everyone’s lives by convincing them that they do in fact need to start yet another project. Its my special talent! I’m not going anywhere but these are cute enough to work on right from home. Have a wonderful peaceful Thanksgiving. You do the same. Staying at home, safe and snug is the sane way to spend Thanksgiving. These are cute! I’ll have to bring them to our knit/crochet group. Your leaf pattern continues to be a huge hit with them. One’s doing them in red for Christmas, others are just doing fall colors. So far, just washcloths and coasters, though at least two plan to do placemats eventually. That’s so good to hear! I love leaves! 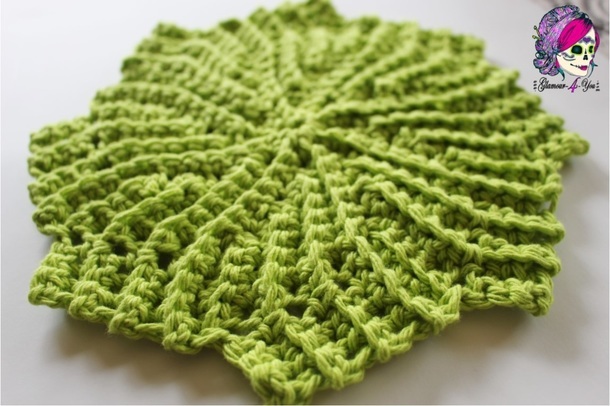 I love to hear that other knitters love leaves! I swear when I sit down to swatch out a “new” lace pattern that’s forming in my head… it usually turns out to be leaves. Leaf pattern? I tried to search, I really did, but my efforts failed. Help? :0 You are most welcome. You can never knit enough leaves. Staying home and cooking so I’ll be having a bit of yarn withdrawal along with my turkey. These are really cute patterns. Thanks and I hope you have a happy and wonderful Thanksgiving! Yikes! You one of the hostess that must feed the hordes then. Don’t work too hard and make them do all the washing up. While you play with yarn. I agree these are very cute!